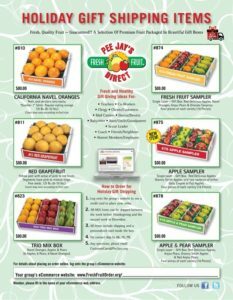 Expand your fruit sale beyond your local area with our “Pee Jay’s Direct” Holiday Gift Shipping program! Now your friends and family across the country can support your organization’s fundraiser. 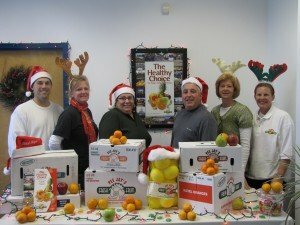 When you offer Holiday Gift Shipping with your brochure or online fruit sale you group could potentially earn thousands of dollars in additional profit. It’s convenient for your customers and simple to do! Holiday Gift Shipping is a great way to send delicious, fresh fruit to friends and family and have it delivered right to their front door, complete with a personalized message. Your customers can order from a catalog of six delicious sampler gift boxes and have them shipped anywhere in the country! In addition, they will be able to choose the day they would like their purchase to be delivered. It’s a great way for your customers to do their holiday shopping and support your group’s fundraiser at the same time! Holiday Gift Shipping is also a great idea for businesses! Our Gift Boxes are healthy and enjoyable gifts for employees, business associates and clients. Each recipient will receive a personalized message with their order. With our new streamlined system, your customers can choose when they would like to have their gift fruit order delivered! Unfortunately, we currently cannot ship outside of the continental United States.